Today’s guest blog comes from Finland’s Antti Haase, the director of AFF’s 2015 Jury Award winning documentary Monsterman about Finnish heavy metal icon Mr. Lordi. The highlight of my visit to Austin was to be awarded in the company of such legends as John Singleton, Norman Lear, Brian Helgeland and Chris Cooper. Norman Lear said at the Awards Luncheon that he considers himself to be our colleague in storytelling. I also got a “buddy photo” taken with Chris Cooper, my all-time favorite actor. After hanging out with these guys for a short time, I understood better than before why the main character Mr. Lordi in my documentary film Monsterman wants to live in a fantasy world. I am a childhood friend of Mr. Lordi. We used to play superhero games in a small forest between our homes in Rovaniemi, the capital of Finnish Lapland. One day back in 1981 Tomi (his name before Mr. Lordi) climbed on an icy roof in a Batman costume. He slipped, fell down and almost died. When I started making Monsterman in 2011, I asked Mr. Lordi about this incident: “What were you thinking?” He answered something that sums up what fascinates me about Mr. Lordi: “I sincerely thought, and still think, that imagination is stronger than gravity.” This attitude also applies to us screenwriters. I had a time of my life in Austin. 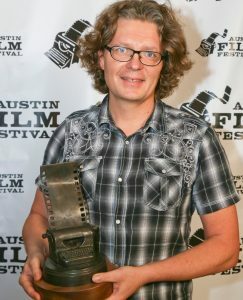 My sincere thank you to Austin Film Festival staff for making it happen. Keep up your great work! And to my filmmaker colleagues: don’t let the gravity pull you down. It’s not too late to submit your documentary feature to the AFF Film Competition! The Final Deadline is July 6th and you can save $5 off the entry fee by submitting directly through our site HERE.